Health Care Renewal: Abort, Retry, Fail - Billionaire Bill Gates Opines, Sans Evidence, on ... the Efficacy of Hepatitis C Treatment? Abort, Retry, Fail - Billionaire Bill Gates Opines, Sans Evidence, on ... the Efficacy of Hepatitis C Treatment? If you needed advice about the technical characteristics of computer operating systems you probably would not go to your doctor for it. So why would you seek the opinion of a software company mogul about the efficacy of pharmaceuticals? market forces were working properly in hepatitis C, invoking Gilead Sciences Inc.’s treatments Sovaldi and Harvoni, which have been criticized by insurers and politicians as too expensive at $1,000 a pill or more for 12 weeks of treatment, before discounts and rebates. While Gilead is the market leader, it’s now facing competition from Merck & Co. and AbbVie Inc., forcing prices lower. 'Curing hepatitis C, this is a phenomenal thing, and now you have multiple drug companies competing in terms of the quality and the price of that offering,' he said. Mr Gates, it seems, has not done a critical review of the data on the new antiviral treatments for hepatitis C. In fact, starting in March, 2014, we have posted about the lack of good evidence from clinical research suggesting these drugs are in fact so wondrous. The drugs are now touted as "cures," at least by the drug companies, (look here), and physicians are urged to do widespread screening to find patients with asymptomatic hepatitis C so they can benefit from early, albeit expensive treatment. Why Do Rich People Who Run Foundations Tout Expensive Drugs? So what is going on here? In a general sense, it may be that people who have become very rich, and have held very high level executive positions, start to believe they are expert on everything, especially in a country increasingly dominated by market fundamentalism/ neoliberalism in which money is touted as the ultimate measure of everything important. But more specifically, Mr Gates may also be spending too much time with the top brass of his foundation, who may be all too used to hawking expensive drugs. In particular, the current CEO of the Gates Foundation is Dr Susan Desmond-Hellmann. When Dr Desmond-Hellmann's appointment as Chancellor of UCSF was announced in 2009, I suggested that she was a very unusual choice because of aspects of her track record in the pharmaceutical/ biotechnology business. During her previous service as President of Drug Development at Genentech, Dr Desmond-Hellmann had defended the then sky high pricing of bevacizumab. Of course, Dr Desmond-Hellmann, as a top executive, personally profited from such pricing. In her last year at Genentech while the company was still independent, her total compensation was over $8,000,000. As we discussed in 2014, while she was at UCSF, questions arose about her committment to public health when it was revealed she and her husband had large stock holdings in the tobacco company Altria. Yet she continued to dismiss the importance of her many apparent conflicts of interest. Members of personnel also move between the Foundation and pharmaceutical companies. For example, in April 2010, a former Merck senior vice president, Richard Henriques, became the chief financial officer of the Gates Foundation. At least two other members of the Gates Foundation leadership have transferred from the leadership of GlaxoSmithKline to sit on the Foundation’s board of directors, including Kate James, the chief communications officer, and Tachi Yamada, until February 2011, the head of the Foundation’s global health program. Similar patterns were observed with the other foundations studied. Dr Desmond-Helmann has continued to use her bully pulpit at the Gates Foundation to promote high-tech medicine that uses the newest, most expensive drugs. For example, in an interview in December, 2015 in the Washington Post, she promoted "precision public health" which would emphasize the supposed "innovation, that speed, that ability to use big data" characteristic of precision medicine brought to public health. However, "precision medicine" has so far not been proven to fulfill its promise to benefit patients. Dr. Desmond-Hellmann cited a $52 million investment by the foundation in CureVac, a German biopharmaceutical company, as the type of partnership that could produce new tools against epidemics. CureVac is developing vaccine technologies based on messenger RNA that would instruct the body to produce its own defenses against infections. The funding, which the foundation announced in 2015, is for construction of a manufacturing facility; the foundation said it would provide additional funding to develop vaccines for several infectious diseases. Are these investments the best way to provide better global health care? An aside in the Bloomberg article suggests they may be more about making money. The foundation reported in May that it had received an unexpected boost to its endowment when a stake in a small biotechnology firm, Anacor Pharmaceuticals Inc., sold for $86.7 million -- about 17 times the fund’s original investment. While the foundation had invested in Anacor to encourage the company’s work in neglected diseases, Anacor shares took off after its toenail fungus drug was approved. I am sure that toenail fungus is not a major public health problem anywhere, much less in the developing world. organisations like the Bill and Melinda Gates Foundation, the Rockefeller Foundation and others are promoting solutions to global problems that may undermine the UN and other international organisations, says the report by the independent Global Policy Forum, which monitors the work of UN bodies and global policymaking. Through their multiple channels of influence, the Rockefeller and Gates foundations have been very successful in promoting their market-based and bio-medical approaches towards global health challenges in the research and health policy community – and beyond. 'There is a revolving door between the Gates foundation and pharmaceutical corporations. Many of the foundation’s staff had held positions at pharmaceutical companies,' the report adds. Bill and Melinda Gates answer to no electorate, board, or shareholders; they are accountable mainly to themselves. What’s more, the many millions of dollars the foundation has bestowed on nonprofits and news organizations has led to a natural reluctance on their part to criticize it. There’s even a name for it: the 'Bill Chill' effect. I would note parenthetically the foundation's board of trustees only includes Bill and Melinda Gates, Mr Gates' father, and Mr Warren Buffet. Most large foundations have considerably larger boards of trustees, with at least some diversity in family membership and backgrounds. Accountability is another concern. To whom do these multibillion-dollar foundations answer? For once, Dr Desmond-Hellmann’s confident responses falter. In reply to a suggestion that trans­parency is not the same thing as accountability — putting everything online means you can see what the foundation is doing, but does not mean that it is being held to account — she seems uncharacteristically stuck for words. 'The way that people can hold us accountable is to look at what we achieved as a foundation through our collaborations,' she says, quickly regaining her poise. So even the foundation's CEO cannot say to whom, and how she is accountable. So maybe Bill Gates' seemingly ill-informed apologia for the extremely high drug prices charged in the US, and his lack of understanding of the evidence about the efficacy, or lack thereof, of some of these high priced drugs is a small humorous story that indicates just the tip of the iceberg. It appears that in our current market fundamentalist, neoliberal world, foundations may be more about promoting the commercial interests of their board members and officers than about improving the lot of humanity. Yet for the most part they may succeed in obfuscating what they are doing through the haze of marketing and public relations. True health care reform would first make transparent the web of institutional and individual conflicts of interest that seems to tie together nearly all big health care organizations, and open discussion of how to make health care organizations better serve health care rather than the narrow financial interest of their top leaders. 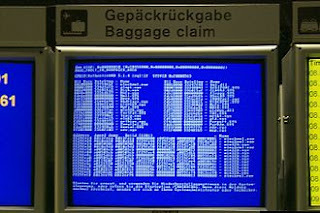 A "blue screen of death"
3. Stuckler D, Basu S, McKee M. Global health philanthropy and institutional relationships: how should conflicts of interest be addressed? PLoS Med 8(4): e1001020. doi:10.1371/journal.pmed.1001020. Link here. Every time I hear someone touting the financial benefits of the Gilead HCV drug over transplantation I remind them that most people with HCV will never need a transplant. I get that dumb look then they go back to touting the benefits. It's like facts that don't fit the narrative are just ignored. Sure these rich elites want to use their money and voice to detate policies, yet they exploiit and project their policies on the very people they made their billions from. Michael Dell (Dell computers) wrote a book recently on technological advancement. I browsed it in Barnes & Noble. It had a chapter on how computers and EHRs were going to "revolutionize" medicine. All the usual boilerplate was there,in fact it sounded exactly like similar stuff I was hearing in the early 1990s.